The Boundary Waters Canoe Area Wilderness in northern Minnesota is America’s most popular wilderness with over 250,000 visitors each year. 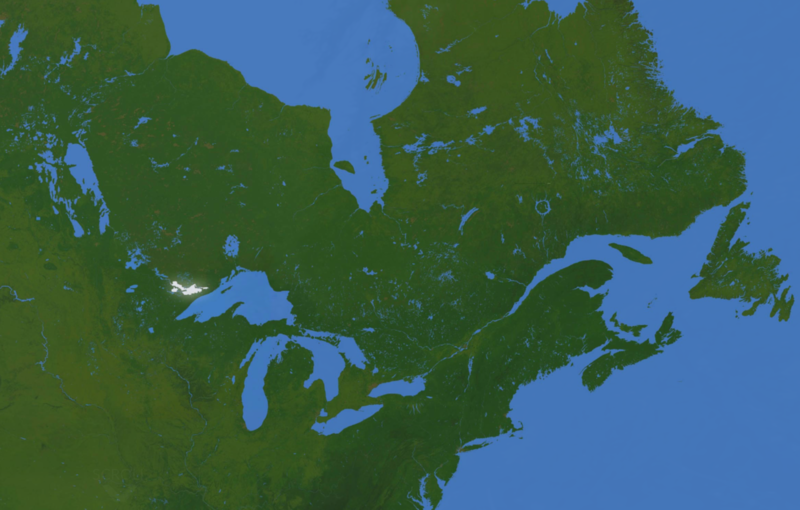 The 1.1 million acres with over 1,000 lakes holds over 20% of all the water in the national wilderness system. From the air, the BWCAW appears to be more lake and stream than land. Some 80,000 people from around the US and the world come to camp and travel each summer by canoe without the use of outboard motors and by dog team in winter. The BWCAW links across the border with the Quetico Provincial Park of Ontario to make a canoe wilderness that is unmatched anywhere in the world. It is the land of Voyageurs and trappers of 300 years past and the homeland of the Ojibway people who migrated here for the wild rice harvest and the fishing and hunting. Over the past 100 years, the wilderness has met many challenges from proposed dams to float planes and motor boats and remote resort development. The Boundary Waters was permanently protected in 1964 by the Wilderness Act and again in 1978 with the Boundary Waters Wilderness Act. One provision was neglected however in these extensive protections and that was the withdrawal of mineral leases outside the wilderness but in the watershed that drains through the wilderness. That detail has lead to another great environmental effort to rectify the oversight. In 2013 our company called a meeting of informed environmentalists in our wilderness edge town of Ely, Minnesota to discuss what had become a looming threat of sulfide ore copper and nickel mining in the watershed of the BWCAW. 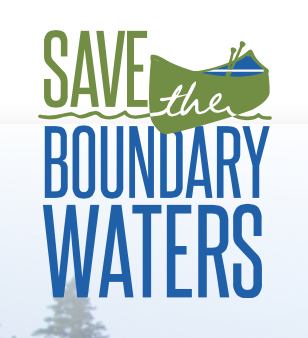 We formed a group that came to be known as The Campaign To Save The Boundary Waters. 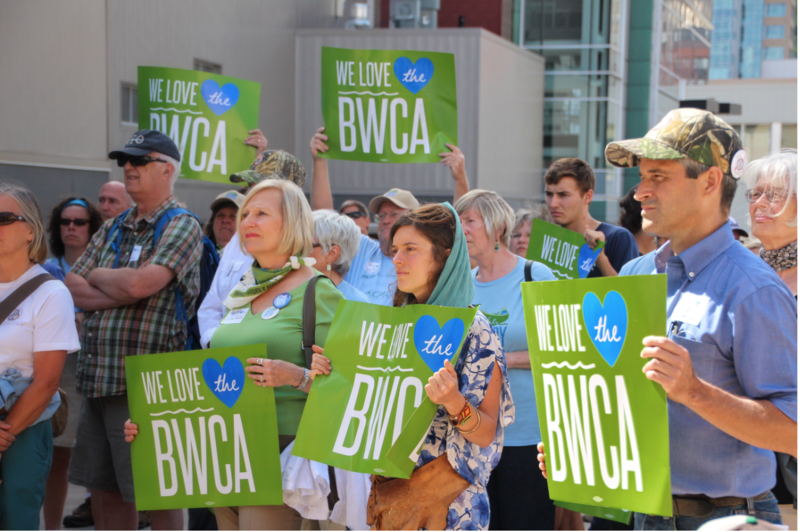 We opened a visitor center in Ely that summer to educate tourists and local people about this threat that could easily pollute the waters of the BWCAW. Research led us to believe that this type of mining known to the US EPA as the most polluting industry in America was just not appropriate for this water-rich ecosystem. Examples abound around the world of accidents from such mines having acid mine drainage into the ground and surface water and multiple blowouts of tailings dams rendering destruction downstream of such mines. Our livelihood and those of our employees absolutely and unequivocally depends on clean pure water throughout the canoe country. We are proud to be able in our wild lakes to be able to drink the water directly from the lake and eat the fish we catch for dinner around the campfire. The Campaign now has grown to a full-time staff of 12 people and hundreds of volunteers across the country. Our efforts in Washington, DC have to lead to serious consideration of at least a temporary withdrawal of mineral leases with the prospect of further action to permanently ban sulfide ore mining in our watershed. We continue with our meetings in Washington every month with Congress and with the agencies like The Bureau of Land Management and the US Forest Service. The effort has been expensive and time-consuming but rewarding for our team at Piragis Northwoods Co. Our efforts will go on into the next administration unabated. Why do you consider LT&C an important initiative and why are you interested in membership? Our business caters to wilderness paddlers and nature loving people. Our town is itself dependent on tourism and its proximity to the Boundary Waters Canoe Area Wilderness. It would seem that similar threats exist near many eco-tourist destinations. I believe we may be able to be an example to others facing similar threats. I hope our efforts here give others some hope that battles like this can be won if the strategy is good and the work supported by many. Why is your case a good example of linking tourism and conservation? As a tourist related business at the edge of one of America’s great wilderness areas, I believe our business and our industry of outfitting canoe trips and dog sledge trips into the Boundary Waters had particular value in the fight to stop polluting industry like sulfide ore mining. Politically we can bring to bear the issue of employment and long-term sustainability. Our business and those of a hundred other local tourist operators rely on clean water and air. We have a proven record of employing thousands in summer but also year round. Politicians have to listen to a business owner when another industry threatens the existence of the employers already in place. Of course, big campaigns on a national scale like the Campaign To Save The Boundary Waters are very expensive. In our business, we have contact with over 6,000 people on our email newsletter list and over 10,000 via Facebook. We contact these people regularly to explain the mining issue and ask for their support. They are a core of supporters who already have an affinity for wilderness. We can raise funds from these appeals tour list. Our local support comes from around the region. These local folks are the core of our financial support of the Campaign. They know our business from being around for 37 years and trust us and are willing to support us financially. Through our e-newsletters, our blog, our Facebook site and in our retail store we strive to inform everyone we can about the need to come to the rescue of the wild canoe country. Are there plans to further improve your example of tourism supporting conservation in the future? Yes. We are constantly finding new ways to leverage our position as employers in a wilderness edge community and to our clients. As an example, by joining with Back Country Hunters and Anglers we are accessing sportsman’s groups to join the fight now and in the future. First and foremost we have to keep up the level of customer support we have been known for and keep our business successful in order to have more influence with more constituents who can then recruit even more folks to join the fight to save the watershed from pollution. How could your example be transferred to another protected area and how could your experience be shared with others? A national campaign for wilderness and natural areas is a big undertaking. Expert leadership is necessary. Our experience over the past four years could be invaluable for others facing similar challenges. Of course, we’d be willing to help to the extent we have time to assist others. This entry was posted in LT&C Examples, News by Peter Prokosch. Bookmark the permalink.